The two ways of obtaining asylum in the United States are through the affirmative process and the defensive process. A defensive application for asylum occurs when a person who has fled their home country due to war or hardship, requests asylum as a defense against removal from the U.S.
A passionate advocate for her clients, Ashley Arcidiacono provides key points when analyzing defensive asylum cases and shares strategies and trial tips so you can get the best results for clients trying to prevent removal from the United States. Ashley M. Arcidiacono will mainly discuss the one year rule & exceptions, past or future persecution, internal relocation issues, finding corroborating evidence, establishing eligibility for asylum due to membership in a particular social group, criminal history & the Frentescu analysis, knowing your judge, knowing your client, using written declarations, narrowing the issues, using lay & expert witnesses and following your roadmap. The following case law will be discussed: Maldonado v. Holder, No. 09-71491 (9th Cir. 2015), Matter of A-B, 27 I&N Dec. 316 (A.G. 2018), and Matter of L-E-A, 27 I&N Dec. 40 (BIA 2017). 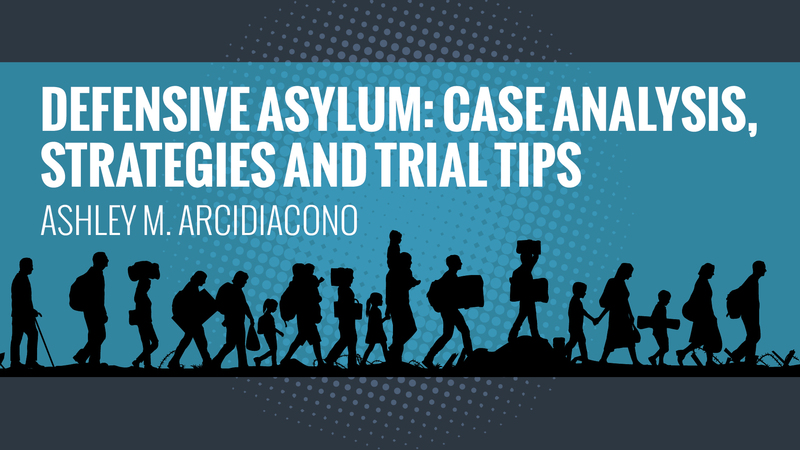 To access the course please click here: Defensive Asylum: Case Analysis, Strategies and Trial Tips. The principal attorney and founder of Abogada Ashley Immigration, Ashley M. Arcidiacono practices solely in immigration law. She specializes in removal defense in immigration court and representing individuals seeking affirmative immigration benefits before United States Citizenship and Immigration Services(USCIS). AttorneyCredits offers CLE for attorneys in California and around the country. For more information about CLE in California please click the following link: CA CLE.